Wind farms act as a top "predator" in some ecosystems, harming birds at the top of the food chain and triggering a knock-on effect overlooked by green energy advocates, scientists said Monday. Wind is the fastest-growing renewable energy sector, supplying around four percent of global electricity demand. Close to 17 million hectares—an area roughly the size of Tunisia—is currently used for generating wind energy worldwide, and researchers warned that developers had "greatly underestimated" the impact the technology has on wildlife. 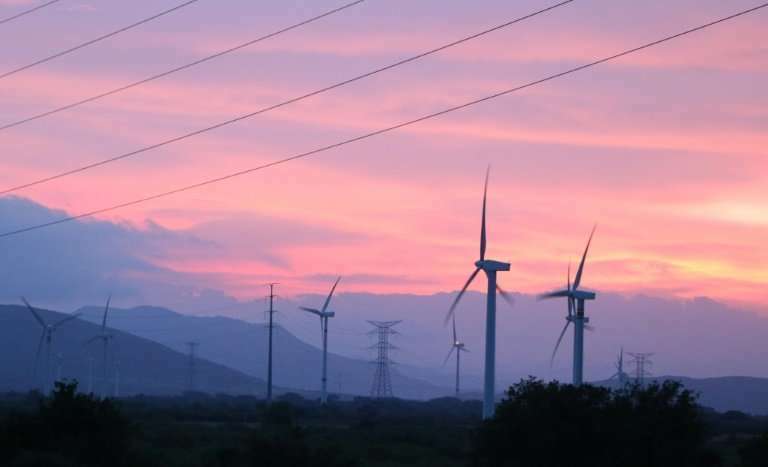 In new research, an international team of scientists studied the effects of wind turbine use in the Western Ghats, a UNESCO-listed range of mountains and forest spanning India's west coast region and a global "hotspot" of biodiversity. They found that predatory raptor birds were four times rarer in areas of plateau where wind turbines were present, a disruption that cascaded down the food chain and radically altered the density and behaviour of the birds' prey. In particular, the team observed an explosion in the raptors' favourite meal, fan-throated lizards, in areas dominated by the turbines. "What was remarkable to us were the subtle changes in behaviour, morphology, and physiology of those lizards," Maria Thaker, assistant professor at the Indian Institute of Science's Centre for Ecological Sciences and lead study author, told AFP. Simulating "predator attacks", humans in the study could get up to five times closer to a lizard in the wind farm zones than one living away from the turbines before the creatures fled. Thaker said her research, published in the journal Nature Ecology & Evolution, showed that wind farms replicated the role of the top predator in the food chain by keeping the raptors at bay. "They trigger changes to the balance of animals in an ecosystem as if they were top predators," she said. "They are the 'predators' of raptors—not in the sense of killing them, but by reducing the presence of raptors in those areas." As man-made carbon emissions continue to rise, Thaker said wind energy was vital in mitigating the effects of climate change. But with evidence that the impact of wind farms reaches further into Earth's ecosystems than previously thought, she called for greater consideration of the environmental impact of the vital green energy source. "It took decades for scientists to realise that wind-turbines were negatively affecting animals that fly," Thaker said. "We need to be smart about how we deploy green energy solutions. Let's reduce our footprint on the planet and put turbines in places that are already disturbed in some way—on buildings for example." Th In converting wind energy to electricity, windmills take some of the ability to do work, from the wind. But the wind does many things. It distributes seed, it moves topsoil, it moderates temperature over large areas. Already, they say regions in the lee of windmill farms are warmer than normal. With large areas of reflective material, solar farms keep clouds from forming, superheat dust in the air overhead and create a massive disparity between the air above and the ground below. Already they say solar farms have effects like the "heat island" effect of cities. Those who promote the claim about "fossil fuels" are just trying to keep "alternative energy" investments going! "Alternative energy" is so damaging, if they didn't have the "fossil fuels" claim going, they new systems would be ordered removed. It's only chemtrails that are changing the atmosphere to create bizarre weather. The notion that utility scale turbines can be put in places that are already 'disturbed' is incorrect. They want large, flat or gently rolling spaces, and the yield difference from microsite analysis & placement can be significant. Move a turbine fifty meters up a slight rise, gain 0.5m/sec average wind speed, the increased output is dramatic. Areas that are already developed are a nonstarter - too much turbulence for large systems to get the smooth, steady wind they require. Hummm, comments from the renewable lobby here are strangely missing. "They found that predatory raptor birds were four times rarer in areas of plateau where wind turbines were present"
How do they know that predatory raptor birds were four times rarer in those same areas of plateau where wind turbines are currently present BEFORE wind turbines were put there? Did they check this? I see NO indication here that they did. Where wind turbines are chosen to be placed isn't a moronic and completely random and arbitrary process but rather is based on where the land is more exposed to the wind. Therefore, if areas where the land is more exposed to the wind naturally deter predatory raptor birds then the reason why the birds are rarer there may have nothing to do with the turbines. "Wind farms are known to be harmful to birds, disrupting their migration patterns and causing above average death rates." FALSE! I actually looked at the research and the evidence is it has NO effect on bird migration as they generally fly over them and not through them. Enviros hate fossil fuels because they emit excess CO2, and pollution. Enviros hate solar because it causes local heat island effects, and CSP will fry birds without bird herding drones. Enviros hate wind because of a few birds getting disrupted or killed (again just need drones). Enviros hate hydropower because the lakes cover up some land. Enviros hate nuclear because of a very very small possibility of a meltdown. Enviros even hate the kind of nuclear that CAN'T meltdown because they are about as dumb as rocks when it come to trying to cover up their real ambitions... Communism! Why do I say that? Well, if they are smart enough to do studies that lead to any credible scientific results, then they are smart enough to KNOW that humanity will need MORE energy. Enviros hate large solar, wind, hydropower and MOLTEN SALT NUCLEAR because they hate America and they hate you. Ok, I'm wrong! They are actually just fossil fuel shills! (they hate clean energy ). A few days ago a paper claimed that AGW will increase the rat population. Well if you kill off 75% of their predators they sure will. There will be a lot more changes than happy lizards.